What is a Class C IP Address? A class C IP Network is a 32-bit network system, so IPV4 protocol for Class C IP is set first 3 bits (higher-order bits) i.e 110 and make a possible of networks around 2,097,152 and a maximum number of 254 hosts. Currently, the default subnet mask for Class C IP Address is 255.255.255.x. The tools are developed with a most efficient algorithm to check if the same class C IP address is hosting multiple domains or single domain. If you have around 2 domains, it is very easy to identify the class C IP for a small number of domains by simply entering url in the text box and click submit button. But you can check around 40 domains at a time whether all the domains are same ip address or not. Many of the website owners host website in shared hosting, which is shared by many other sites of the same class C IP address. The Class C IP checker checks if it hosted multiple domains on the same hosting and identify duplicate IP address. An IP address or Internet protocol address is a numerical value that specifies to a unique address in the network. It is a fundamental protocol used for communication over the internet networks; which are converted into a set of packets, addressed, routed & received by the network devices. There are 2 types of IP address protocols that are IPV4 and IPV6. An IPV4 address is a 32-bit long and allows upto a maximum of 4,294,967,296 (2^32) unique IP address. But in the case of IPV6 address is 128-bit long, which allows a maximum IP address is 3.4*10^38 (2^128). We know that the IP address is created in binary form but defined in decimal (IPV4) and hexadecimal (IPV6) to make understandable for the users in an easy way. The Internet Engineering Task Form (IETF) created an IPV6 address and came into existence in 1988. This changed the world with an increase in available address space over 2^128 globally. More changes were made to improve the IP packet efficiency, routing and security over the network. The hierarchy of internet protocol contains classes of IP addresses which are used for various host requirements based on the network chosen. But the IPV4 address protocol is mainly divided into 5 classes of IP address and all the 5 classes present in the first octet of IP address. Class A - In Class A IP Address the first octet is set to 0. It ranges from 1 - 127, means IP starting from 1.x.x.x to 126.x.x.x but 127.x.x.x is reserved only for look-back Ip addresses. Currently, the default subnet mask for Class A is 255.0.0.0 with over 126 networks((2^7)-2) and 16777214 hosts ((2^24)-2). Class B - In Class B IP Address, the first 2 bits are set to 0. It ranges from 128.0.x.x to 191.255.x.x. Currently, the default subnet mask for class B is 255.255.x.x with over 16384 (2^14) network address and 65534 ((2^16)-2) hosts. Class C - We have already discussed in this page detailly. Class D - In Class D IP Address the first 4 bits in the octet is set to 1110. It ranges from 224.0.0 to 239.255.255.255. As we know that the Class D IP Address does not have a subnet mask and reserved for multicasting purposes. It does not require to extract the host address from it. Class E - Currently the Class E IP Address is reserved for R&D work and other experimental purposes. It ranges from 240.0.0.0 to 255.255.255.254. Even for this Class, there is no subnet mask. Do you want to check the website hosting provider, use our free website hosting checker tool to see the service provider? If the website sharing with the same IP address, it will impact seo rankings because other websites with the same IP are blacklisted by search engines due to copyright issue. Having a dedicated IP to your hosting will be better than shared hosting. The tool will help in identifying such kind of domains and we alert you to go for upgraded hostings like VPS or Dedicated hosting that is not shared the same IP. Why do we need a Class C IP Address Checker? To make a website superior, search engine algorithm analyzes all your backlinks, content quality, site performance, and IP address location of your domain. Many small agencies and hosting companies hosts single or multiple sites on the servers to do business, especially shared hosting. If any domain is blacklisted it creates a negative effect on other domains because of hosting multiple sites on the server. Hosting a website uses different Class C IP addresses which are used represent the location of the hosting. Multiple Class C IP address is given to various hosting centers all around the globe. When a user created a website hosting any of these data centers will have Class C IP Address guaranteed. So with the help of Class C IP checker, you can identify how many sites are being hosted on the server. Then the user can carefully identify which sites are being blacklisted with the help of this tool. In order to rank high in google make sure the IP address is not blacklisted, or purchase a VPS hosting with a dedicated Ip address. How do the Class C IP Checker works? The tool works very simple to use, just enter the domain name of the sites that you want to identify the Class C IP Address. You can enter upto 40 domain URLs then type the captcha code and click submit button. You can see a list of Class C IP Address of all the domains. The tool runs in the background and gathers all the required information without a need of any third party server. The purpose of this tool is to check the same class C IP is hosted by many domains on shared hosting, the tool will also help to find the duplicate IP address of class C blocks. You just need to enter by copying URL and paste into the text box to check class C IP is shared by many domains or not. A Class C IP address is especially suitable for Small and medium-sized companies. 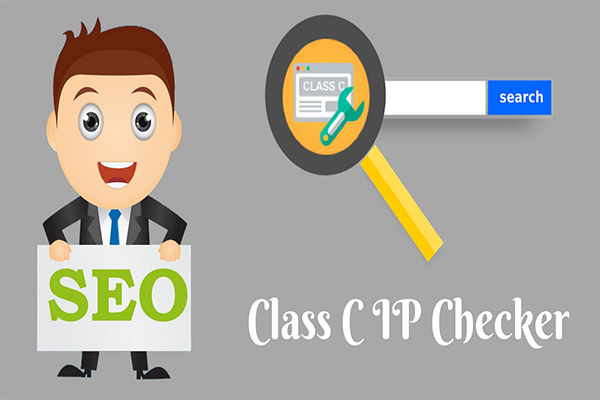 To gain an advantage in site rankings then you must have their own Class C IP Address. Because larger companies exploit to make use of this address to rank higher on search engines like Google, Yahoo, and Bing. The tool can support upto 40 domains to test and Identify Class C IP Address for all the domains.